Many Home PCs arrive wrapped with a bow, having been a gift from some well-meaning friend or family member. 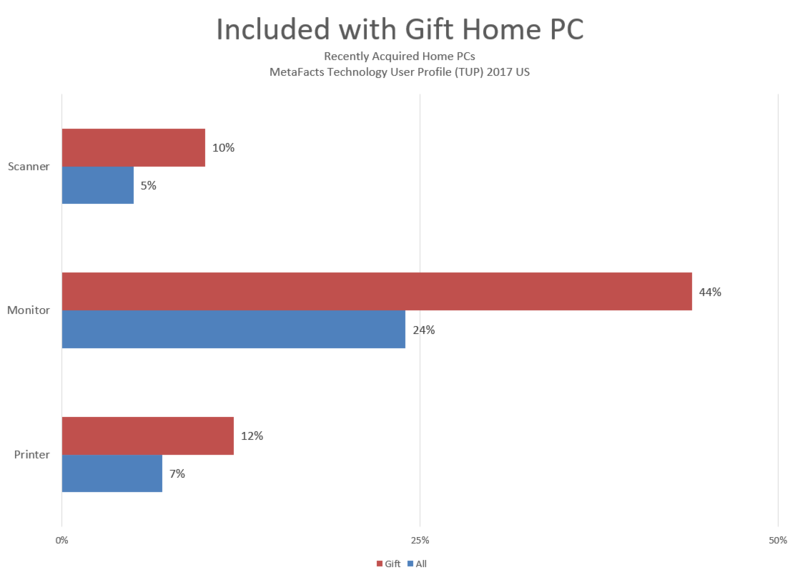 In our most recent wave of Technology User Profile (TUP 2017 US), we found that 11% of recently acquired (2016 or 2017) Home PCs were acquired as a gift. Many of the gift Home PCs came with more than wrapping and a bow, with a higher-than-average share bundled with a scanner, monitor/display, and printer. It stands to reason that these generous donors are including their used scanners, monitors, and printers. TV or not TV, is n0t the question. TV is alive and well enough, although being viewed in many different ways than before. In the battle for eyeballs on the largest and multiple screens throughout American households, more than one over-the-top box or stick has made inroads. These devices are being actively used by 31% of Connected Adults. Also, most viewers use more than one, with the average number in active use being 1.4. In a bid for dominance, Apple has recently released its revision to its Apple TV, in an app that allows discovery and watching of content through Apple TV, iPhones or iPads. One first question that may be asked – Who’s leading the market? Roku can make that claim, with one in eight (12%) of connected adults using any of their various Roku boxes or sticks. However, with the average number in active use being 1.4, a great deal of users have more than one. As in any competitive scrum, a next question is the position of the other major entrants. Google, with it’s various entries of Google TV, and Nexus has the #2 overall position, and is also #2 behind viewers with Amazon Fire TV, Apple TV, and ASUS Cube. So, while at first glance Apple’s announcement might be about Apple extending its integration of content that can be enjoyed across Apple devices, there’s more to this. This move is also about Apple strengthening its position against Google in the quest for broader market leadership. This MetaFAQs research result addresses one of the many questions profiling active TV viewers, and the devices they use to watch. Many other related answers are part of the full TUP service, available to paid subscribers. The TUP chapter with the most information about TV viewers across all devices and platforms is the TUP 2016 Consumer Electronics Chapter. Extensive information about the mobile personal computer market is available in TUP – Technology User Profile. The market for changing technologies is always in flux, and mobile PCs are not exception to the rule. It’s important to know your market, and know it well–is the coffee-shop CEO the leader of the mobile PC pack, or is it the high-school gamer? Oftentimes the original die-hards for a product are no longer its current audience. Strong research on changing demographics brings the new market to the forefront. Below are a few examples of questions addressed in TUP related to the mobile PC market. The full TUP service enables drilling down beyond the answers to these questions to identify which other technologies, services and behaviors are disruptive and to profile which market segments are and aren’t adopting. TUP is much more than a one-dimensional market view or opinion piece, since it provide solid answers to the following questions as well as many others. Longevity: Are mobile computers used for more or fewer years than desktops? If so, what’s the difference, and who uses them longest? Primacy: What is the center of the user’s world? Their home PC, work PC, mobile phone? Is it one device or many? How are smartphones challenging or complementing mobile PCs? Which market segments are coalescing around which platforms? Which segments are utilizing cloud storage or sharing services? Used/Refurbished PCs – who buys them? What channels do people use for buying PCs? How about printers and printer supplies? How do Best Buy customers compare to Office Depot of Staples shoppers? What’s the likely near-term outcome for an OS upgrade? Which market segments have the oldest OS? How does the life and lifespan of a PC vary by form factor? Does it vary by brand? By user segment? By tech spending behavior? Who is using mobile payments? How much is assisted navigation part of life – and on which platform? Which user segments use which devices or services? Which operating systems dominate within which segments? How prominent is printing images from mobile phones? How about from tablets? Which key tech devices are consumers planning to buy? Which segments show the strongest plans and how does this compare to their tech spending? What are the leading PC brands among Hewlett Packard printer users? How does this differ for the other major printer vendors? Extensive information about the Tablet and e-Book Reader market is available in TUP – Technology User Profile. The market for changing technologies is always in flux, and Tablets and e-Book Readers are no exception to the rule. It’s important to know your market, and know it well–is the (e)book-lover the same person you expect them to be? Are Tablets in new hands or among those with the most tech gadgets? How are these products use differently – or similarly – to their other Smartphones, Notebooks, or other key tech devices? Below are a few examples of questions addressed in TUP related to the Tablet and e-Book Reader market. The full TUP service enables drilling down beyond the answers to these questions to identify which other technologies, services and behaviors are disruptive and to profile which market segments are and aren’t adopting. TUP is much more than a one-dimensional market view or opinion piece, since it provide solid answers to the following questions as well as many others. How do PC/Online & Mobile Phone activities compare? How is this different for Tablets or e-Book Readers? Which segments use which device for the most activities? Which segments are utilizing cloud storage or sharing services? For which activities? What do most people do with their mobile phone as compared to their PC? Which align with which platforms? Netbooks – how soon and with which market segments? Are mobile computers used longer or shorter than desktops? If so, what’s the difference, and who uses them longest? How are smartphones challenging mobile PCs? Which market segments are coalescing around which platforms? How does PC and online usage vary cross segments such as workplace company size or industry? How have PC/Online & Mobile Phone activities changed? How might this affect apps? What channels do people use for buying PCs? How about printers and printer supplies? Which industry groups have varied levels of adoption? Do users find their PCs to be more useful or less useful? Which users are the most practically-oriented? What is the impact on privacy in use of social networking? Birth order = brand order? Does top brand have similar draw cross-countries? Netbooks – are they replacing notebooks? Stalling smartphones? Withering? What are the overall future trends for the Internet? iPhone users – who are they really? How do they compare with Android, Windows and Blackberry users? What’s typically bundled with a PC? When do you grow up and give up on your Apple? When do get one again, if you do? Which PC brands dominate the PC market? How does this vary within brand segment? How much is assisted navigation part of life – and on which platform? To what extent have Dell and Lexmark penetrated the printer market? Which segments have they penetrated? What is Hewlett Packard’s share among Dell computer owners and Dell or Lexmark printer owners and has this changed? How prominent is printing images from mobile phones? What do users sync or store in the cloud? How does this differ between mobile phones and PCs? How do users share images – social networking sites or photo-specific sites? Which users are the most active? Multitasking – who’s using lots of devices for lots of apps, few devices many apps, etc.? Which segments are utilizing the cloud? For which activities? Which segments are using which devices & carriers? For which activities? How does Hewlett Packard’s market share differ between the different types of printers (inkjet, multifunction, laser, etc.)? What other items (printers, software, monitors/displays, extended service plan, etc.) do people typically buy with their PC purchase? Which market segments are renting movies? Are they renting DVDs at a retailer, by mail, or at a kiosk? Do they watch them online? What’s the likely near-term outcome for an OS upgrade? Which activities are different for dial-up than broadband? What’s driving bandwidth needs? What happens to old PCs? Are they dumped? Recycled? Sold? Which segments dispose in which way? What makes a smartphone a smartphone in the consumer’s eyes? How does usage compare to basic mobile phones? What are the user segments? Is the smartphone killing PC shopping? Which segments have recently paid for a downloaded mobile phone app? Tech adoption cycles may not be as fast as the tech-focused think. How many and which users still use film cameras? How many people use calendars on their PC, their mobile phone, or both? Which types of people are these? Navigation, online maps, location-based mobile phone services, and GPS – who’s getting directions? How do ad volumes affect usage? What is the tech-owning profile of active gamers? High-bandwidth or dial-up? Many consumer electronics entertainment products or focused on gaming? Many computers or few? How does this vary by segment? The above questions are answered with the TUP 2010 edition, and even more questions are answered in the TUP 2011 edition.